The enquirer would like to know where it is and the approximate date. This looks very like Wylde Green station, on the Birmingham to Sutton Coldfield branch, looking north. I'd put the date to within a few years of 1900. I sent a copy to a friend of mine in the Sutton Coldfield Railway Society who is very well up on railways in and around Birmingham, asking him to confirm the location. His reply: "Definitely Wylde Green and before WWI. There were two waiting rooms on the Up platform and you can just see the second one in the distance. Seems a large staff for quite a small station without a goods yard." The comment on "large staff" I think is just modern thinking. 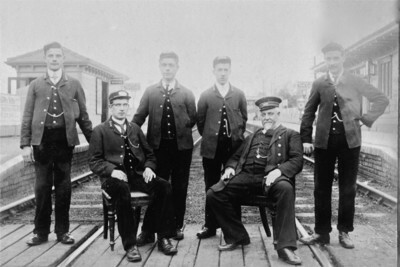 All stations had staff in those days just as all railways had plenty of carriages for all fluctuations in traffic.